After nine months in Oz it was time for an adventure somewhere completely new. Our taxi picked us up at 4am on July 24th, 2013 to take us to Sydney airport, but our flight was delayed by over an hour. 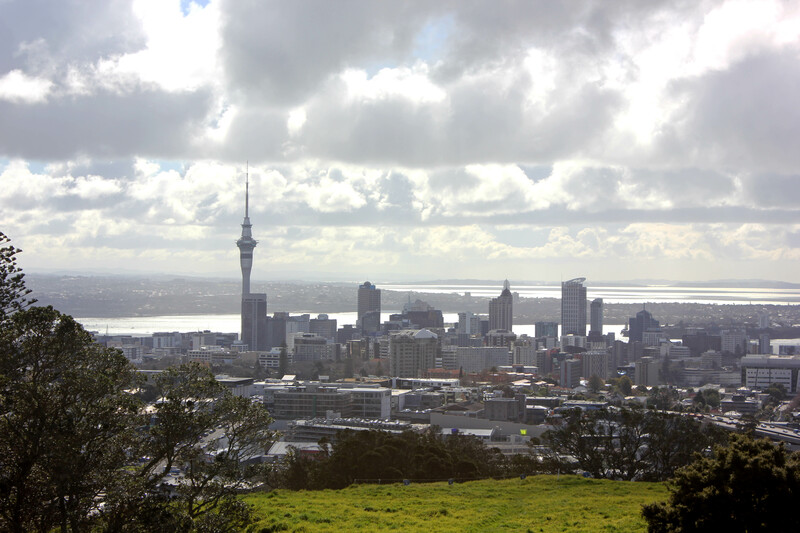 When we eventually arrived in Auckland we got the airport shuttle to the city centre and checked into our Nomad’s hostel before wandering around the CBD and harbour. It’s quite a small, pretty place dominated by the Sky Tower needle, but the day we arrived was a really grey dreary day that could make a rainbow look beige. The biggest revelation of the day was that our trusty Aussie supermarket Woolworths was known as Countdown in New Zealand. We were in a strange new land indeed. 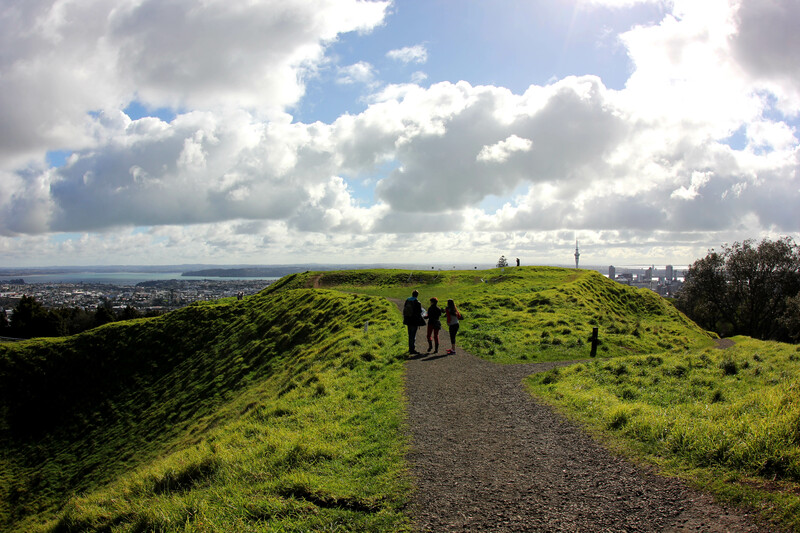 The next morning we took the bus to Mount Eden, a dormant volcano in the middle of Auckland offering spectacular views across the city and the harbour from the top. A nice Auckland lady pointed out the landmarks to me on my map which blustered ferociously in the wind. I was excited to spot Eden Park, the rugby stadium where the All Blacks famously clinched their first Rugby World Cup in 24 years in 2011 with an 8-7 victory in the final over France. 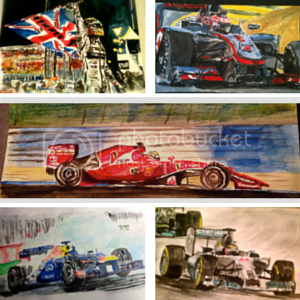 Back in town, we checked out the art gallery. The modern art was a bit weird but the Maori portraits and old European paintings were cool. After lunch in Albert Park, we had a free sausage sizzle in our hostel and got the bus to Parnell to meet Jodes’ friend. Parnell was a cute suburb and we drank in a nice pub and found a decent ice cream shop too. 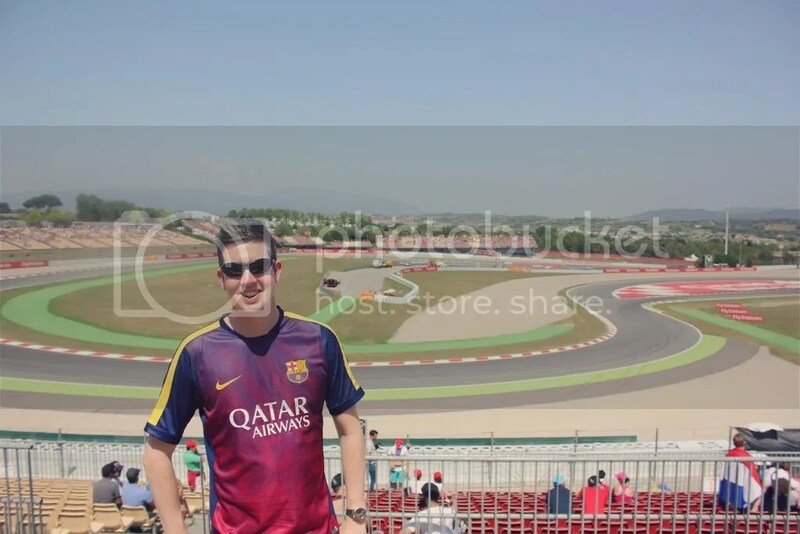 It was the following day, however, that our New Zealand trip really began. We were booked on a Kiwi Experience bus, scheduled to drive us from Auckland all the way through the North Island and South Island to Christchurch over the next three weeks. 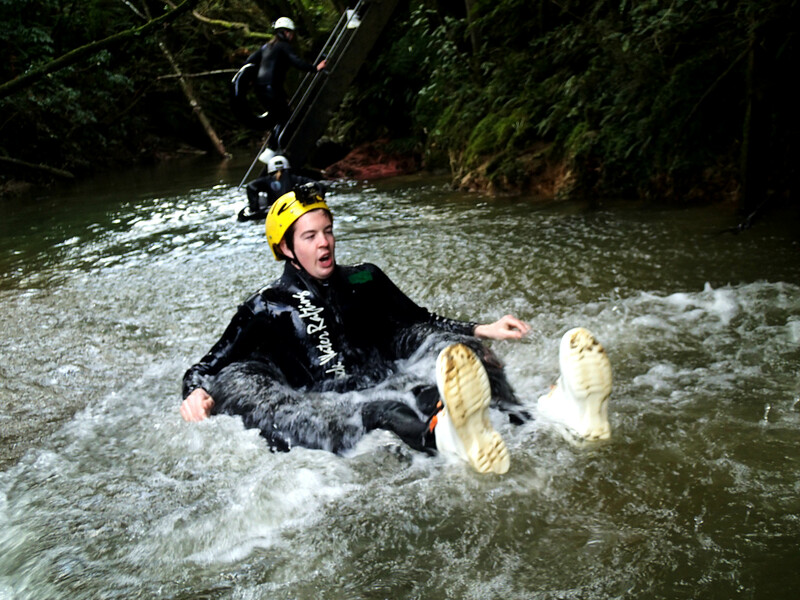 Kiwi Experience also offer a fantastic range of activities every day throughout the trip so we were pretty excited. We left at 8:30 driven by Mangee, a hilarious and frankly brilliant bus driver who was to absolutely make the journey for us. On Kiwi buses, accommodation and activities forms get passed around for everyone to fill out as there are a number of options at each stop. We filled these out as we headed up windy roads to Cathedral Cove by Hot Water Beach, where we walked for forty minutes along spectacular coastline. 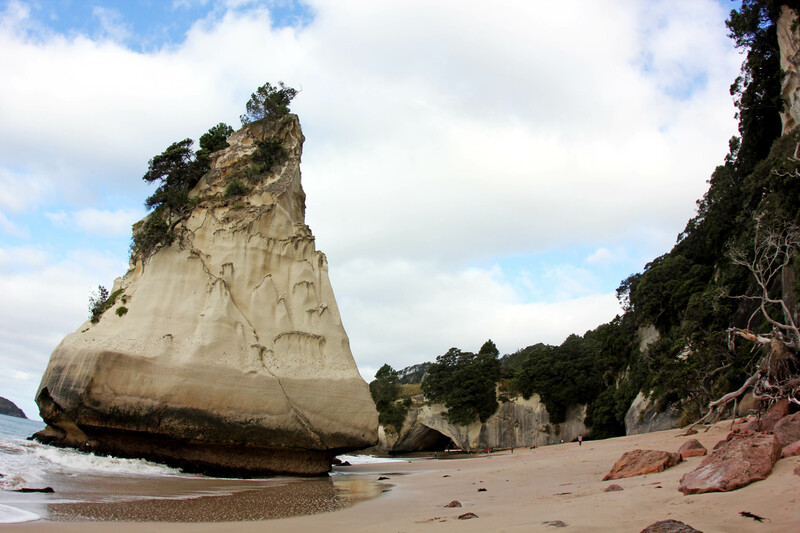 The whole of Cathedral Cove bay is filled with islands whilst the rugged pathways seemed very Scottish/English with their fresh countryside air. Once down on the beach, we discovered plenty of photo opportunities with stunning rock formations and arches. Afterwards the coach took us to our accommodation for the night, the Top Ten Holiday Park at Hot Water Beach. We briefly bounced on a bouncy pillow trampoline thing at the holiday park and then the coach took us round the corner to Hot Water Beach itself. 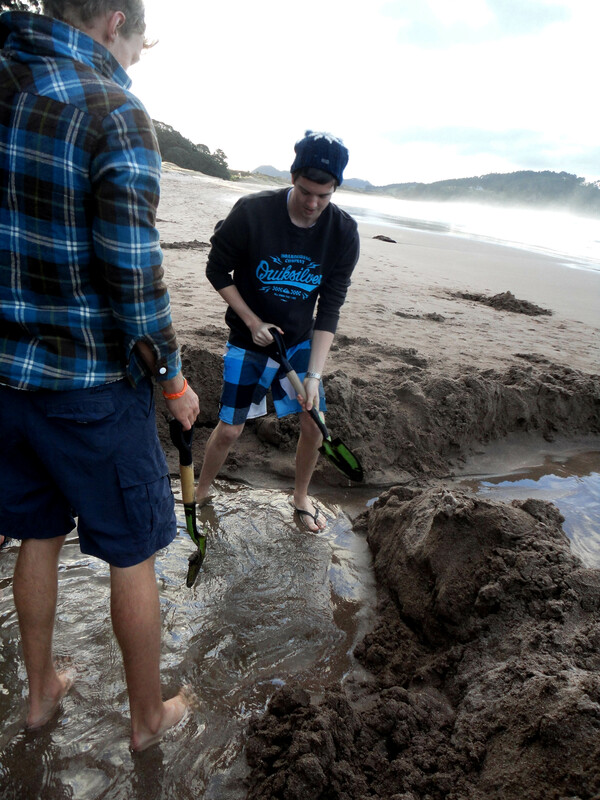 We dug pools in the sand to uncover water as warm as a hot bath – in some parts it was actually unbearably hot and almost scalding! It comes from geothermally heated spring water under the sand. We got chatting to people on our trip and I laid in the pool for a bit, only to jump up when Jodes and some of the other girls screamed. I was just in time – the cold tide came crashing in, bitterly soaking everyone in the adjacent pool whose bodies had adjusted to water of a much warmer temperature! It was quite hilarious. Shivering, we reboarded the bus and headed to the cave entrance. 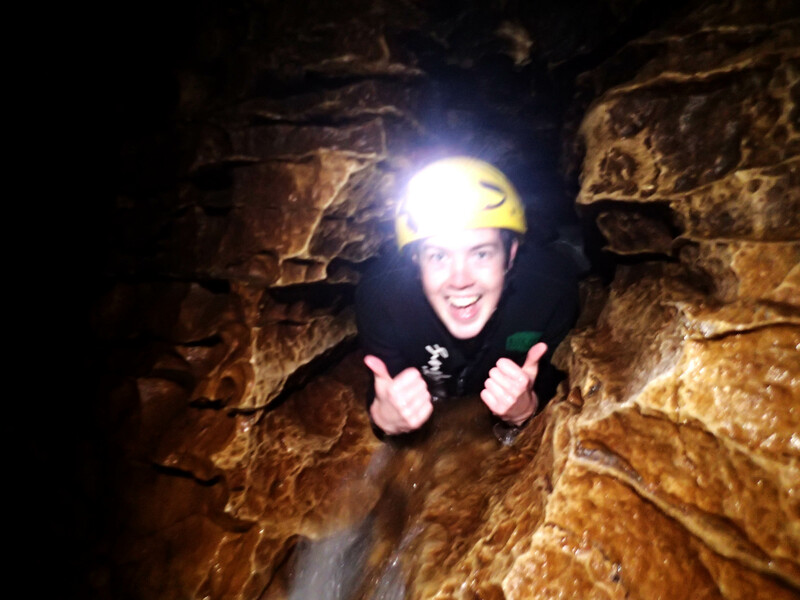 We nervously grabbed our black water rafting tubes and clambered through a small entrance into a dark chamber. We assembled in a dank corner with spider/cricket like bugs on the walls, before heading off into the abyss. 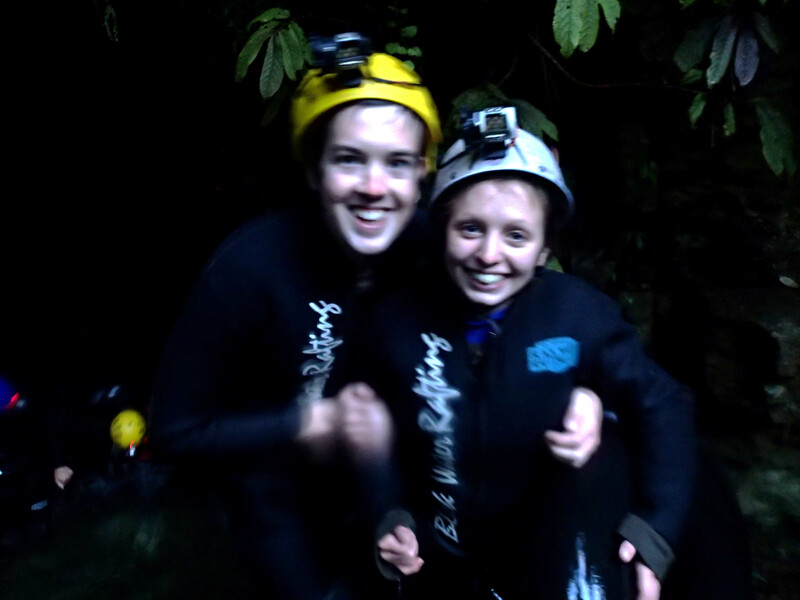 Before we even properly got in our rings for the first time the guide pointed out a MASSIVE EEL we had to dodge. Freaky stuff. We headed onwards and then dropped down a couple of small waterfalls. We assembled and lined up where we were instructed to turn our torches off. Looking up into the darkness we saw hundreds of glowworms – a beautiful sight of nature. They are actually maggots (but glowworms sounds better than glowmaggots) and the glow comes from a chemical reaction in their intestines – it’s shiny maggot poo! We then threw ourselves down a super big waterfall with an icy fresh splash, stopped for photos and finished with a ten minute game of ‘find your way out in the pitch black’. So sans-torches we bounced like human pinballs between a rock on the right and a hard place on the left. Jodes got stuck, which was almost as funny as when she fell out of her tune and couldn’t get back in! Black water rafting was a brilliant, unique experience but boy were we glad of the hot shower, soup and bagel at the end! 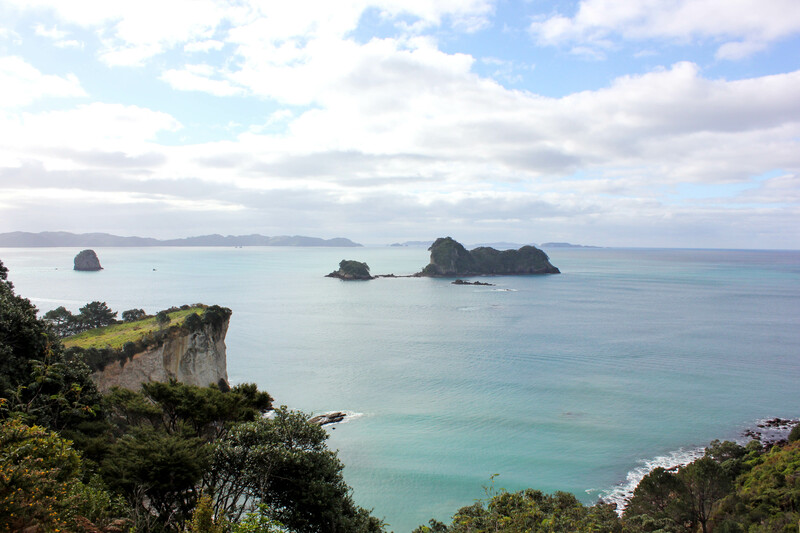 Remember to check out my video for amazing footage of Auckland and Cathedral Cove. 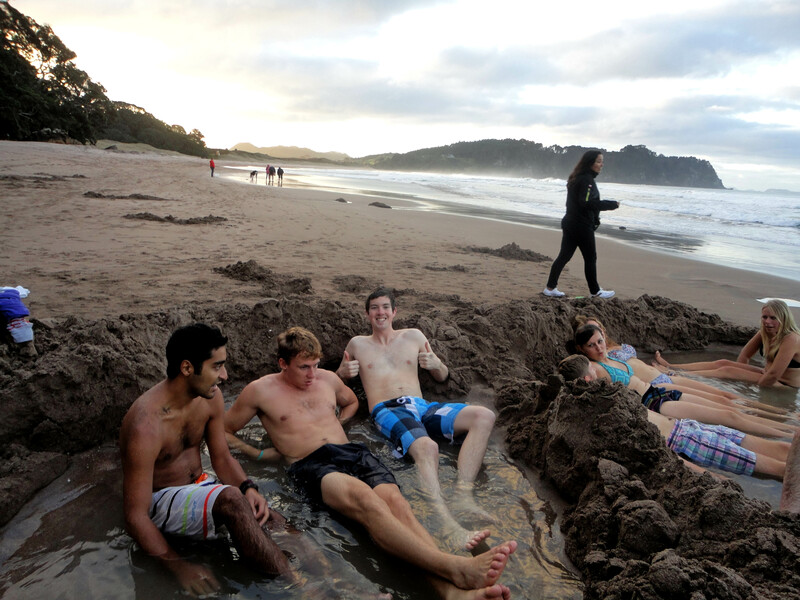 Next time: geysers and mudpools in Rotorua. Chilly but stoked at the end! 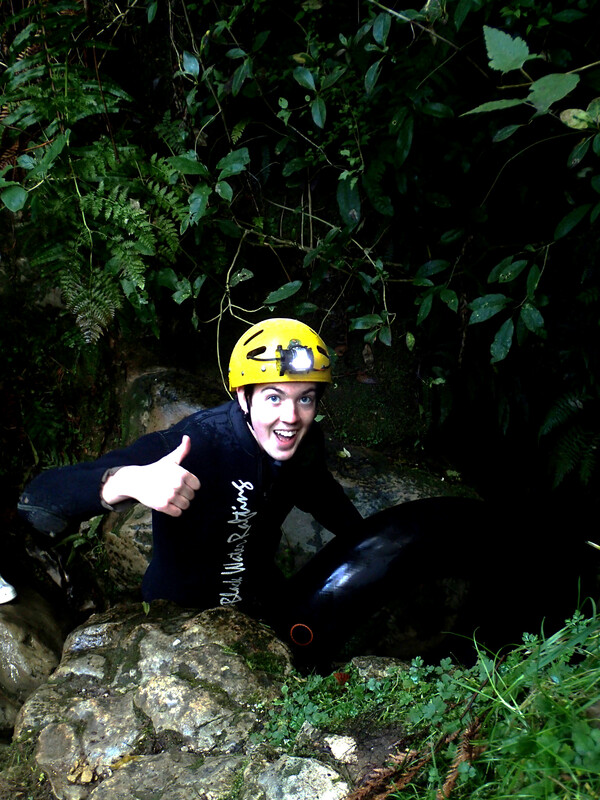 This entry was posted in New Zealand, Travel and tagged Auckland, Caves, Hot Water Beach, New Zealand, Travel Stories, Waitomo. Bookmark the permalink.